Well, I said it was probably going to be the toughest race I’ve ever competed in, and it didn’t disappoint. I’ve never suffered to such a physical and mental level before and it will take some beating. However, it’s worth noting that this was my first race over such a long distance. I’ve only run a 45 mile and 54 mile ultra, and no more than 100 miles in one training week. On top of that, Caesar’s Camp is run over very tough terrain. Only 30% of those that started the 100 mile race made it to the finish. I approached the Caesar’s Camp race with high expectations. I’d actually written the splits of last years course record on my hand to give me something to pace to and provide motivation. I was really pleased and privileged to have a decent crew behind me. 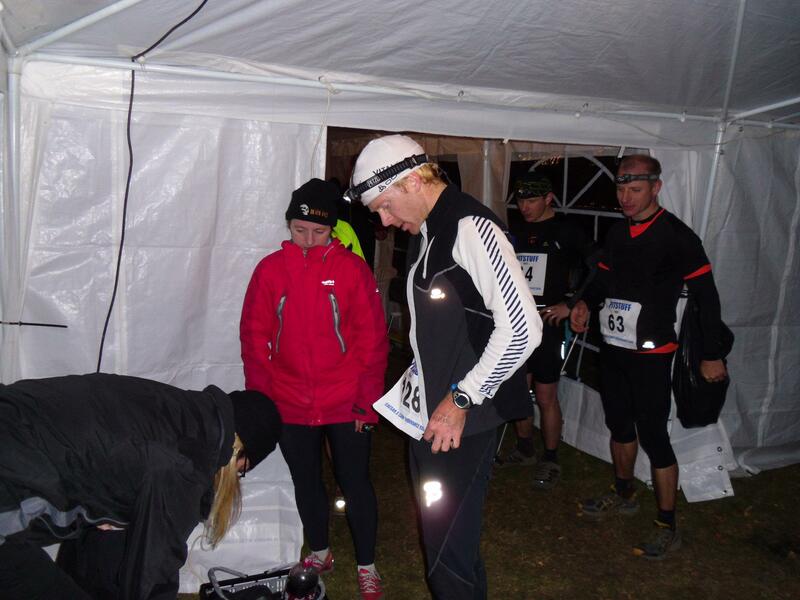 Yve, my brother Dean and an elite ultra running friend Jo Kilkenny were there from the start to get the tent up, and provide whatever I needed at the end of every lap. Iain McNaughton was also turning up late in the evening to do a couple of laps as a pacer. The race consists of 10 x 10 mile laps with pacers allowed after lap 6 (60 miles). 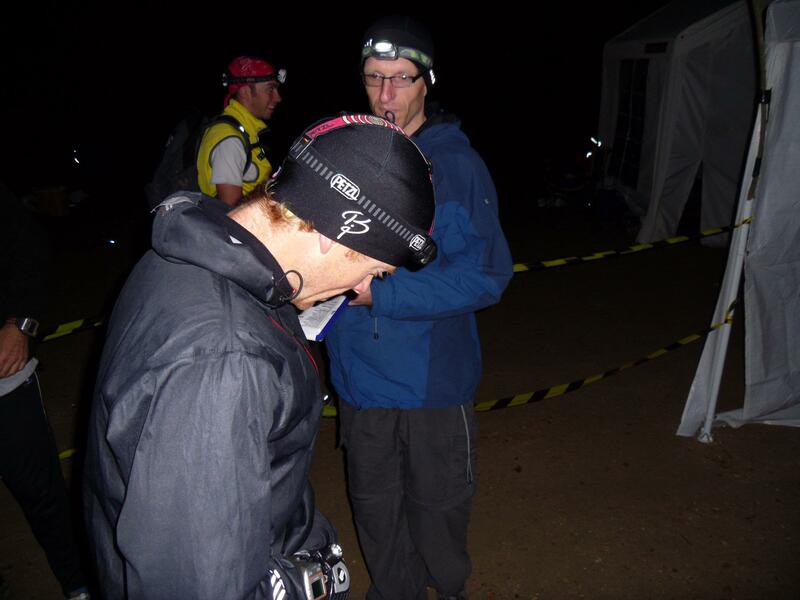 So the original plan was to race at a decent pace up to 40 miles on energy drink and gels (with a few nibbles from the aid stations at start/finish and 5.5 miles), then change into warmer clothing and pick up headlamp(s). I’d then try to hold-out until 60 miles where I knew I’d get the morale lift from pacers. 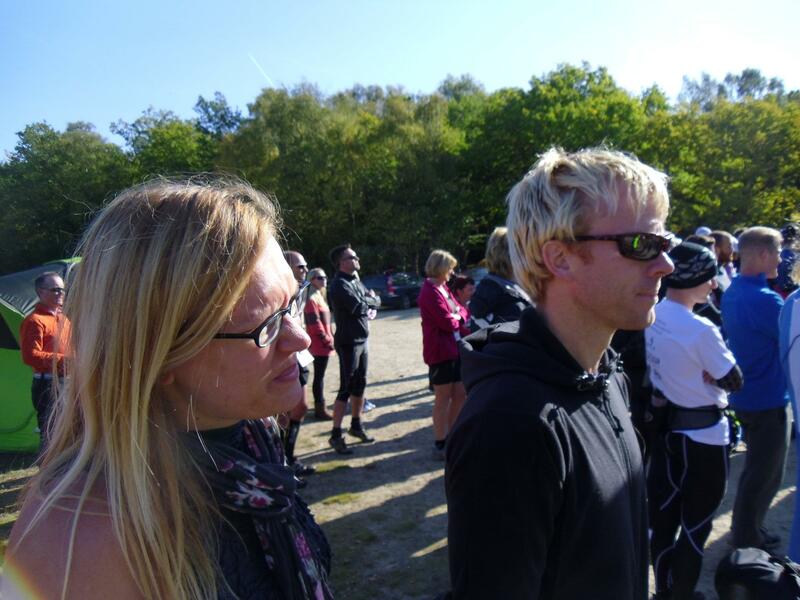 Jo was going to run with me for lap 7, Iain for laps 8-9 and Jo again for the final lap (10). I will list all equipment, nutrition, supplements at the end of the report should anyone be interested. I’d had a few chats with Tamsin Lewis regarding painkillers and stomach-liners, and Ed Stanley was good enough to lend me his Garmin F310XT watch, as my F310 had drowned in Portugal. I like to keep myself amused with pace, splits and other targets (like the course record) so the watch was very useful. I’d prepared myself quite well and had even done a few recces of the easier parts of the course to get an idea of what I was letting myself in for. For the first time since spring my health was fine with a good average resting heart rate and decent race weight (69.0kg). My only concern of course was the training. I reckon I’d done enough running to cover a good marathon to 30 miles. But I love a new challenge, and I wanted to try and break through any physical and mental barriers my body would throw at me (perhaps retribution for the Double Iron Lanza DNF). The Caesar’s Camp Endurance Runs are 30, 50 and 100 miles over the 10mile loop. The 50 and 100 races are run from 12pm, with the 30 mile run from midnight. 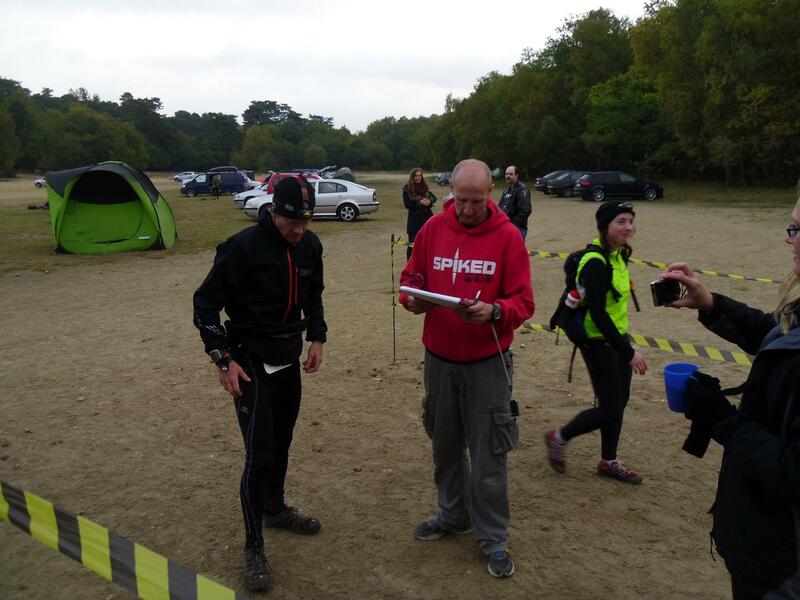 Checkpoint (bar-coded) is at the start/finish of each lap with aid stations at the start/finish and 5.5 miles. Plenty of snacks were provided inc hot and cold drinks. The terrain is tough! The first 3.5 miles involve switching back and forth across various steep little gullies, most of which have large stones which either give beneath your feet or are planted in the soil, providing obstacles. 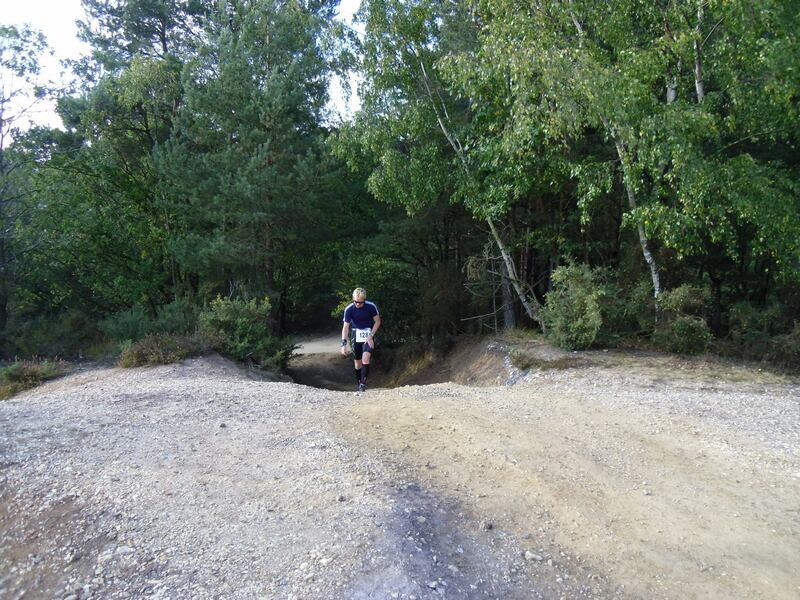 A few trenches here and there, sand banks and you’ve got a great xc event…..shame it’s over 100 miles! The only flattish section comes from 3.5-4.5 miles where you can finally get a bit of pace up before dropping into the forest. You then have a mile of narrow forest tracks and hills until a small clearing and the aid station at 5.5 miles. The forest tracks continue for another 3 miles over some more sharp undulating terrain, before exiting at the foot of the toughest climb. Again it’s not particularly long but it kicks up sharply towards the end on more lose rocks and a large step. The final 200m ends with a steep bank (that seemed to be added for fun), before a drop along a sandy finish. 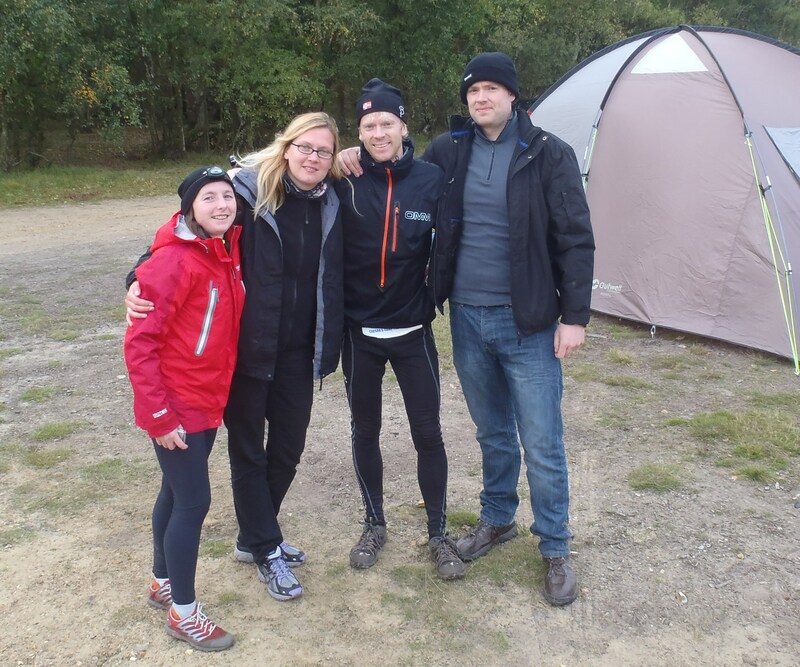 At 10am on Sat 22 Oct we drove down to Caesar’s Camp near Aldershot and while the crew were setting up the tent I met Scott Garrett and a few other runners before the pre-race brief from the organiser Henk. Henk is quite a character and I have to say his brief was very colourful and entertaining, I loved it. We all started at quite a pace and I just about held 2nd to 3rd for most of it despite a fierce scrambling up the first gully. One runner went tearing off the front and after around 4.5 miles (the forest section) I lost sight of him. It was difficult to know who was in the 50mile race or the 100mile race without looking at the numbers (100+ for 100mile runners). We were all jogging up the banks and looking pretty fresh and keen, as you’d expect. I didn’t have to stop at the 5.5mile aid station for the first few laps as I was carrying enough nutrition, but I’d grab a beaker of liquid and a few nibbles before continuing. About 1mile before the finish I took a wrong turn and headed down a bank. I only lost about 1min but I made sure I kept an eye on the tracker function of the gps watch from then on. 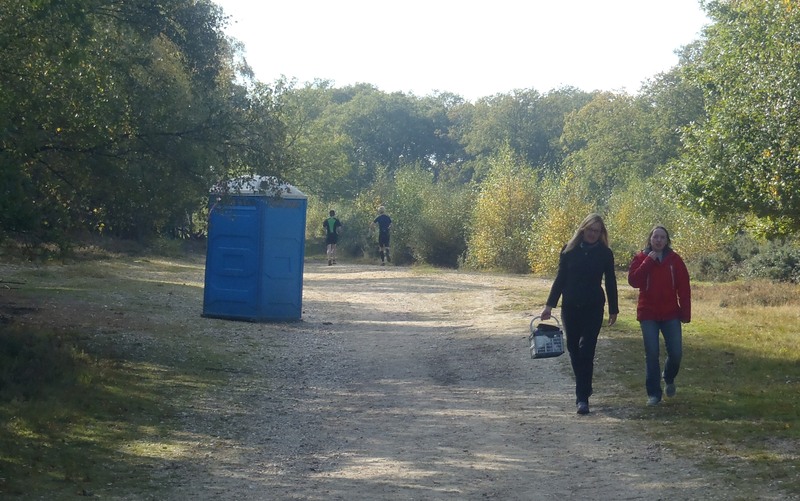 Yve was really quick in in replacing my empties as I ran through the checkpoint for the start of lap 2. Another good lap. I was started to pull away from those behind me and was settling in, although a few early trips on tree routes was unerving. Fatigue started to develop during this lap. It was after all 30miles of hills at a little under optimal pace. At the 5.5 mile aid station I saw someone head out just in front of me and presumed it was the leader. I grabbed a few snacks and caught up with him. We ran together for a few miles through the woods. He was in the 50mile race and said he’d run 1hr18 for the first two laps but had hit a wall. I didn’t envy him having to run another two laps with nothing in the tank. I decided to move on and keep the pace up. At the checkpoint Henk came up to me and asked how I was. “Fine thanks” I said. “Well…you’ll feel s**t the next time around!” he said. I was starting to feel a bit cold in my ss Helly Hansen top and compression shorts so we took a 5min time-out here to put on a thermal ls top, light leggings and buff hat. This was the last of the faster lap splits. 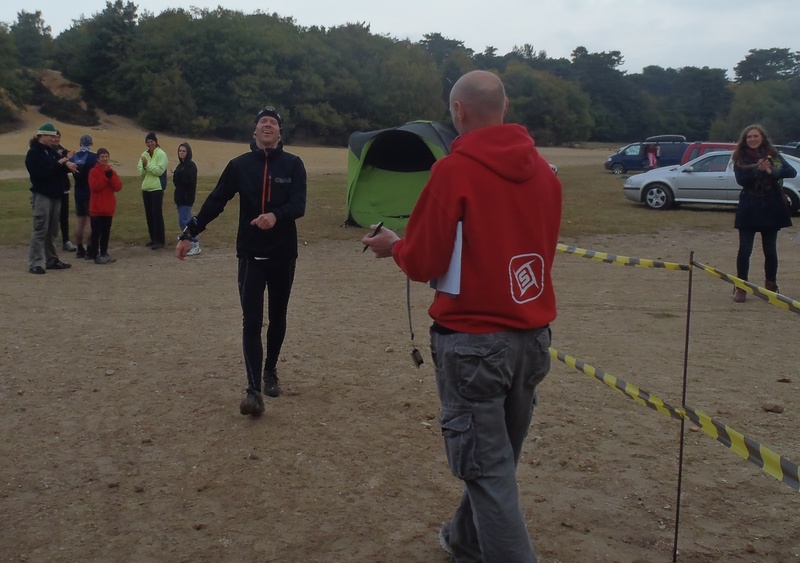 I was 20mins inside the course record for the 100mile but starting to feel uncomfortable. I’d already tripped and kicked various stones and tree-routes so my larger toe nails were very sore. I even pitched forward towards a tree on one trip running down a hill. If I hadn’t forced my hips forward to counteract my imbalance (and pull a couple of lower back muscles in the process) then I’d have head-butted the tree. The same thing happened to me towards the end of the Brecon Beacons Ultra and Malvern Hills Ultra. I’m not lifting my recovering leg far enough off the ground. Laziness I call it! At the end of the lap I tried to nibble a bit more food but it was already becoming a struggle to get anything substantial into the stomach. A few mouthfuls of pot noodle here, a piece of flapjack there. There was plenty to choose from but my appetite was diminishing along with my legs. Jo reminded me that after two more laps I’d have company which was good to know. 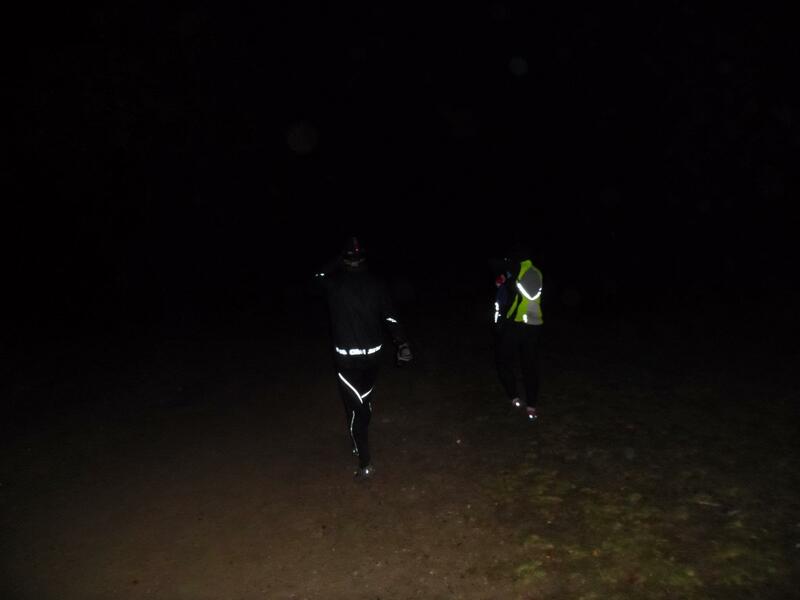 It was starting to get dark now so we put on a gillet, changed hats, compression socks (I was getting blisters from the other socks) and attached the headlamp. 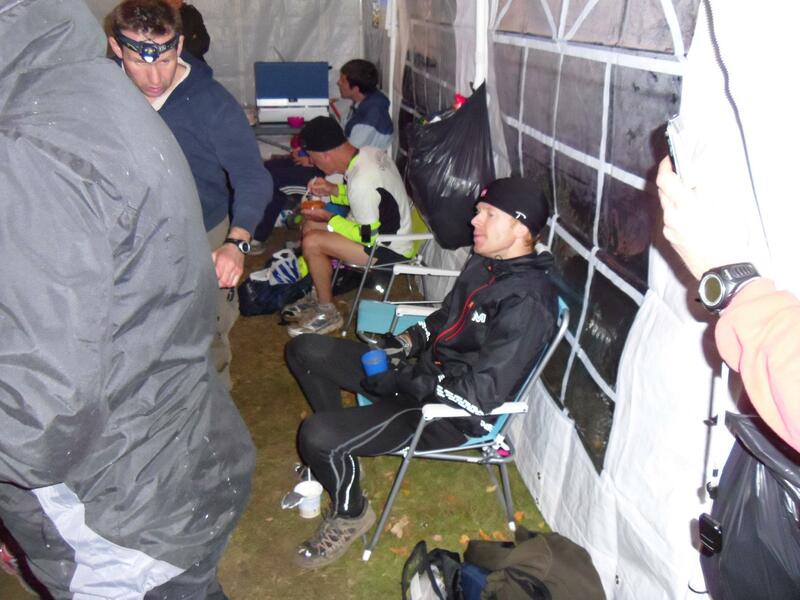 A slower lap, although a good 6mins were spent in the aid station after the checkpoint and the darkness would inevitably slow times down from now on. I could now see the lights of Aldershot from the hills and imagined the families sitting at home watch X-Factor or the like. So, it could have been a lot worse! My pre-race aim was to get around 50miles in 8hr15min. I managed 7hr59 so was quite pleased with that, but at what cost now I was faced with the whole distance all over again! If I had been in the 50mile race then I’d have won with a new course record, and I now wished I’d entered this race in advance. The race rules state that anyone in the 100mile race who wishes to pull-out at 50miles will get an official time and UTMB qualification points(2) but will not count towards the final positions. This is probably why a good number of people pull-out at this point in the race. 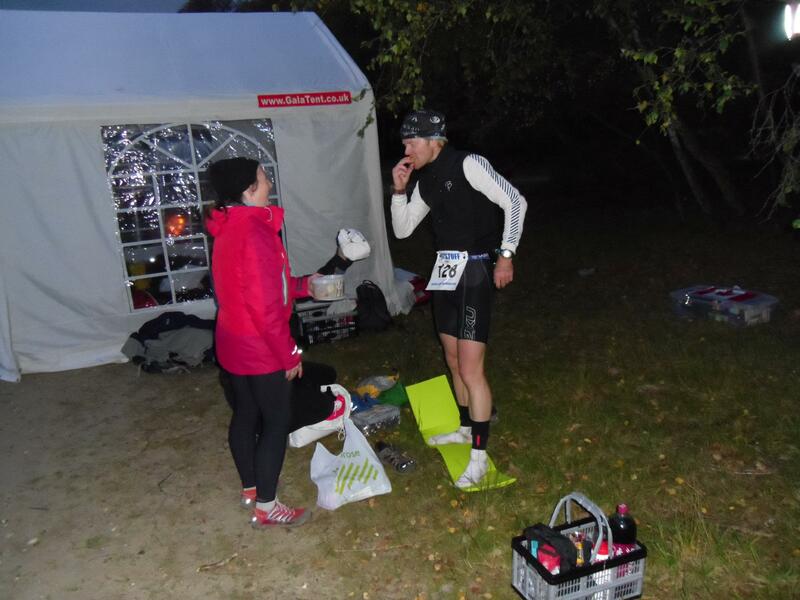 I was feeling really tired by the end of the lap but knew that 2 UTMB pts was not enough. I needed the full 3pts from 100miles to add to my 2pts from the Malvern Ultra [5pts from two races to qualify for UTMB]. I took a bit of a breather and sipped a coffee but couldn’t stomach any more food or liquid. Henk came over with what (I presumed) was a pint of lager. I won’t tell you what he said it was, use your imagination. …If you quit now you’ll get over it, there’s a nice cosy sleeping bag on a thermarest in the tent with your name on it! At the 5.5mile aid station I took a breather. 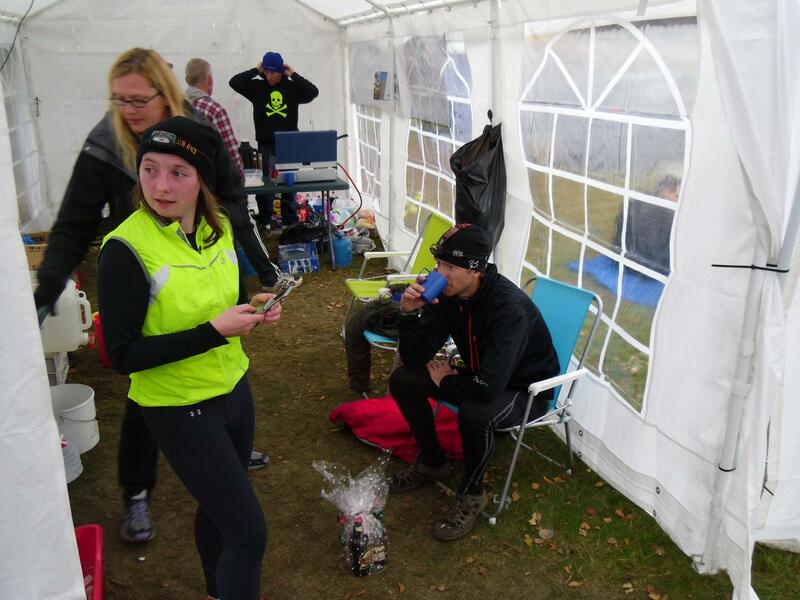 I’ll never forget the two other runners sat on the chairs in the gazebo sipping coffee and wolfing down rice pudding like there was no tomorrow. They actually looked quite content. Why couldn’t I race like that! I wasn’t in the mood for chat so tried to cram a few small spoonfuls of rice pudding into my mouth and headed back out into the darkness of the forest. The shadows cast amongst the trees from the flashlight conjured up all sorts of images. I thought at times I was being watched by people, very Blair Witch. After slowly scrambling the final long hill it was a relief to shuffle back to the checkpoint. 60miles completed, and Jo was ready to head out. All I could think about was sitting down and trying to switch off for a few mins. I was told I had a 1hr lead on 2nd place, but it didn’t really register. I was too concerned about the state of my health and whether or not I should continue. I’d seen people almost bent over double in races over the years, dragging and pushing their bodies to the limit, and beyond. I wondered if I could do the same thing and whether or not this was just a bad patch, albeit one that was lasting several hours! At least now I had company for the rest of the race so if I did pass out or take a fall then it was a lot safer. I mumbled, moaned and apparently said I wanted to quit. Jo jumped in and had a right go at me. I took a few more mouthfuls of liquid and looked at whatever Yve and Dean thrust into my face before starting lap 7 with a long walk. Yve and Dean were absolutely amazing through the whole night, and I was glad to have them there. Somehow I was still on course record pace, but from the 7th lap my pace dropped dramatically as I was now not only walking the uphills but also half of the flat as well. Jo did a great job of trying to keep my pace up and generally keep me amused, although I was in no shape to make conversation. Just a few words here and there. About one mile before the finish of the lap the 30mile midnight runners ran across our path looking nice and fresh, headlamps bobbing up and over the hills. As we came back into the tent at the end of the lap I saw Iain waiting, fresh-faced with a box containing some McDonalds goodies. I tried a few french fries and immediately spat them out as they were too dry. Shame, I was really looking forward to a burger during the first few laps of the race. A 12min stop, but I wished it was longer. Laps 8 and 9 were the worst of the race. It was more of a hike than a run and I was quite frustrated. I’d also started to develop a strange nausea. At first I thought it was as a result of too much sweet liquid and foods early on (or recent lack of). I then started to question the supplements and painkillers I’d taken during the first 50miles [I had stopped taking anything after that point because I didn’t want the likes of aspirin sitting in an empty stomach]. It became so bad that I couldn’t breathe heavily without feeling ill. This meant a slow walk up the steep hills (and a few pauses to catch my breath). Also, as strange as it sounds, I felt nauseous just thinking and talking. I had to withdraw into myself a lot more now and the head dropped. At the end of lap 8 I took another 12min break. I’d been told that second place had made a little ground on me and was 45mins behind after the end last lap (7). A similar lap to the last one, most of which was spent walking. I’d try to do some sporadic runs every now and then to make the lap pass quicker, but they were generally only 5-30secs long. Iain and Jo were great pacers, staying quite close but obviously letting me dictate the pace. It was dark and cold (7c). I was wet from sweat, hungry, tired, in pain and knew I just had one more lap to go before it would end. I was actually quite impressed with how my leg muscles had handled the distance. Despite everything else breaking down I hadn’t suffered any major muscle fatigue or stiffness until 80 miles into the race. My toes were taking a battering from tripping and kicking obstacles but they couldn’t get any worse. At some point towards the end of the lap I found a new wind. I still have no idea where it came from and I don’t think it was the thought of the finish. I had managed to eat 2-3 cookie style biscuits from Iain with a few sips of water to wash them down….maybe they were re-lighting the pilot light in my stomach. At the end of the lap I thanked Iain and then proceeded to drink a can of red-bull style drink and some coke. I wasn’t ready for any substantial food but knew I’d now be able to scramble the last lap, and was up for it. Henk came over and mentioned the guy in second came through the last checkpoint (end lap 8 ) just 25mins behind. I had no idea how much time he might have made on lap 9 and this was the incentive I needed to push for home. Jo new the score and spent most of the lap either right in front or 20 metres ahead to encourage a faster pace. It worked well. If I walked the lap then I would probably get caught, and I was buggered if I’d let that happen after everything I’d gone through. I told myself that if we could get up the final big hill without being chased then I had it in the bag. I had to look over my shoulder many times during the lap. On the run off the final hill there was a slight pang of emotion, although I was too tired and dehydrated for it to be any more than than a twinge in the eye. I crossed the line, shook hands with Henk and could finally sit down and enjoy a relaxed coffee with my crew. Overall I was really pleased with how I handled the distance. I’ll be coming back to Caesar’s Camp next year but to have a good crack at the 50 mile race. It’s a very challenging xc course which makes it that much more exciting, and satisfying on completion. 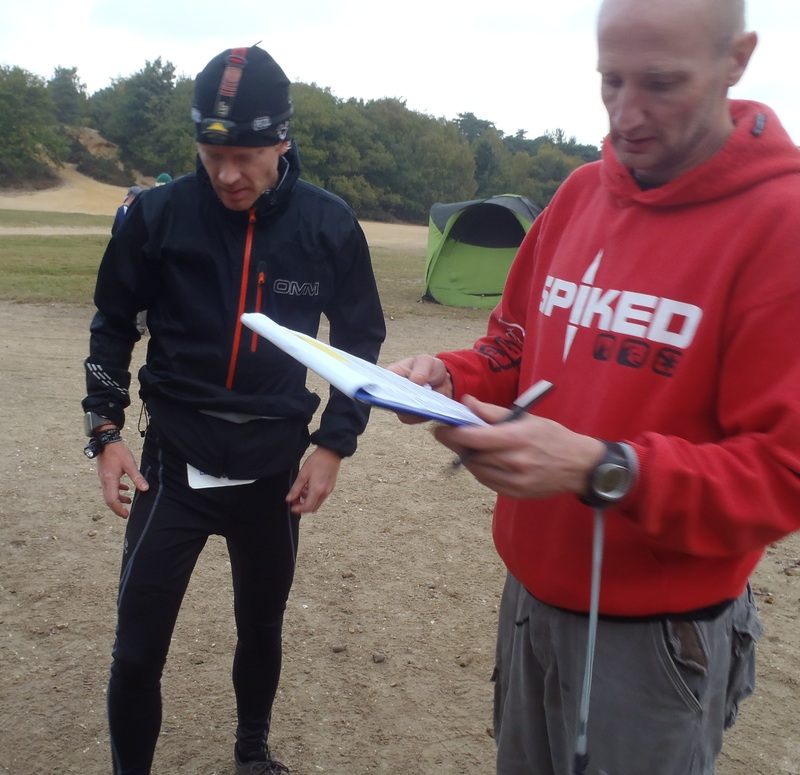 I also now have my qualification points to apply for UTMB either in 2012 or 2013. The application is in December and the race is held in August. 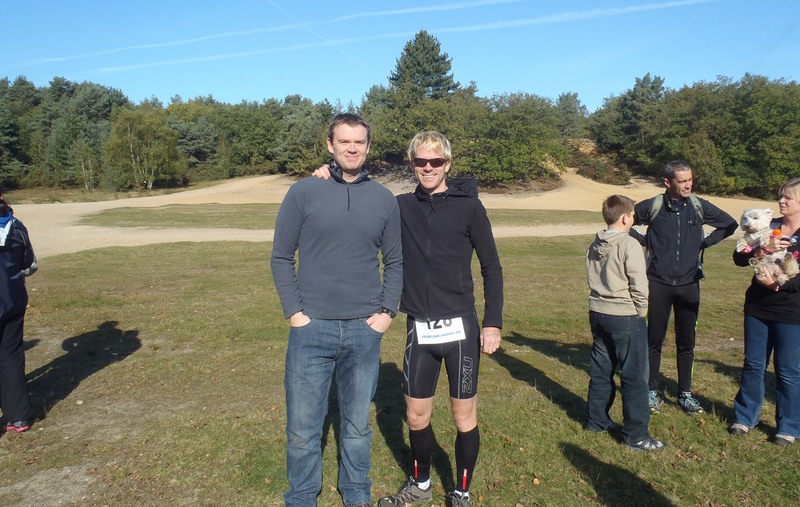 I’m already entered into London Marathon (April) and Malvern Hills Ultra (May). Overall I’m really enjoying the new challenge of ultra running and there are so many race possibilities in a season from 30miles to 24hr or multi-day races that I’m spoilt for choice. Record so far reads 3 races completed, two wins and a runners-up. Couldn’t be happier. Next is the Brecon Beacons Ultra. We have a number of teams competing in this under Elagen, who have been good enough to sponsor all of us. I hope to recover most of my fitness to at least do my bit for the team. Finally want to say a big thank you to Yve, Dean, Jo and Iain for helping me get through this event, I couldn’t have done it without them ! Clothing (top to bottom): Odlo ski hat(2), 7oaks buff hat, Petzl tikka+ headlamp, Helly Hansen tops, Bjorn Dhaelie gillet, Quechua gillet, Nike fleece, OMM smock, Garmin Forerunner 310XT (thanks Ed), Cyberlite headlamp (back-up), Bjorn Dhaelie leggings, Quechua leggings, 2XU compression shorts and calf guards, Nike compression socks, 1000mile stability socks, Inov8 roclite 295s. How long did your 310 last for – they are only meant to go for 20 hrs? Thanks Marcus. I turned it on about 15-30mins before the race and I think it lasted around 15hr30 – I will wait to hear from the friend I borrowed it off as I can’t download on to his Garmin Connect. So looking at around 16hrs. I had the tracking function on continuously, swicthed screens a few times and used the light on the odd occasion which may have reduced the time span a little. Thinking about buying myself one for xmas once the 910XT comes out and the 310XT inevitably drops in price. That is one extraordinary achievement ! You hint at the emotions you felt but text can only describe 10% of how it really was. This phrase sums it up . . . I get the feeling that you decided you were going to continue until you either finished or they carried you off the course. Excellent result and excellent report, really summed up the event. Good luck with next years attack at the 50. I was quit a few places behind you, but still managed to get round. got me simply addicted on ur web-site! Iwill certainly wind up being back a lot more regularly.